Surrounded by the oldest rainforest in the world, there is no better place to relax and be pampered than immersed in this natural habitat. The spas located in Daintree and Cape Tribulation promote the amazing natural surroundings of the rainforest where you can commute with nature and relax. The Daintree Wellness Day Spa at Daintree Eco Lodge closely aligns itself with Aboriginal culture and is named ‘Wawu-karrba’ which translates to healing of the spirit. The Daintree Wellness Day Spa integrates the wisdom of ancient cultures, spiritually, medicines and healing to give a full, mind and body rejuvenating experience using local plants and recipes. Nestled in the heart of Cape Tribulation in the Daintree Rainforest is the Heritage Lodge and Spa. For a relaxing and rejuvenating massage surrounded by the world’s oldest rainforest this is a heavenly retreat. Located just north of Mossman in the Daintree Rainforest is the luxurious Silky Oaks Lodge. The ultimate in pamper and relaxation. This spa uses a mixture of traditional and the latest in modern techniques. Truly a self-indulgent experience within the gurgling sounds of the running waters of the Mossman River. Yes, is possible to go to the Daintree rainforest and go fishing! Hook-A-Barra fishing adventure is located at Wonga Beach with the stunning Daintree Rainforest as a backdrop and only a few kilometres from Cape Tribulation and Mossman. The fishing pods are filled with the best salt water from the Daintree River and stocked with over 1500 Barramundi (albinos) and Mangrove Jack. Hook a Barra from 1-12kg 50cm – 1m. For beginners, guidance is provided by experienced staff so you can perfect your catching and landing techniques. Take a trip with local guide Dave Patterson who has over 30 years’ experience of fishing the waters of the Daintree River. Alongside his fishing tours he also guides photography and nature tours. Phone 0740986111 ww.daintreefishing.com.au. The richness of the earth surrounding the Daintree Rainforest and the tropical climate makes it one of the few places in Australia where it’s possible to grow exotic fruits seen nowhere else in the country. Just driving around Cape Tribulation you can see roadside fruits (and coconuts) being sold on an honesty box system. Just drop your money into the money box and fill up on organically grown exotic fruits. A chance to taste, touch and smell exotic fruit grown in the lush soils of the Daintree Rainforest. Treat your taste buds to experiences they have never had before. Sample fruit direct from their Cape Tribulation orchard. From the delectable chocolate pudding fruit to the creamy mamey sapote to breadfruit chips, from custard apple to mangosteen. Discover a whole new world of fruit that is a world away from the fruit counters in your local supermarket! Held at 2pm every day from June to October (rest of the year not on Tuesdays or Thursdays). With the amazing array of rare and exotic fruits that are grown in Cape Tribulation and Daintree, what better way to taste them than through the cold, fresh flavours of a locally made ice cream. You’ll be blown away by the flavours served here. From soursop sorbet to yellow capote (canistel) gelato to Passion fruit, Davidson plum, Wattleseed and Jackfruit gelato. Your taste buds will be all of a tingle! Gluten free, dairy free and vegan options available. The Daintree River is the perfect place to get close to nature in this World Heritage site. If you want to see wild crocodiles up close along with other amazing birds, snakes, frogs and fish then cruise down the Daintree River and immerse yourself in this amazing experience. You will also witness seeing a wide diversity of birds that also inhabit this rare eco environment. All the guides have years of experience and understand the nuances of the Daintree River and Daintree Rainforest so that you have the most informative commentary and a chance to see the best of the local wildlife. Solar Whisper is an electric solar boat that emits no noise or fumes so you can experience more fully the sounds, smells and feel more immersed in the experienced. If you take a tour with Billy Tea Safaris to explore Cape Tribulation they have an exclusive lunch spot that the local wallabies will love to join you on. They are so used to people that you can enjoy hand feeding them. On their Cape Tribulation tours they will also let you get up close with Eclectus parrots, baby crocodiles, pythons and other native wildlife that inhabit the wilds of the Daintree Rainforest. If you like the smaller types of wildlife with eight legs and wings then a visit to the Daintree Entomological Museum in Cape Tribulation will satiate your passion. Spotted Cuscus, Rufous Owl, Bandicoot. Self-guided walks in the Daintree Rainforest: Mardja Botanical Walk (30 mins), Dubuji Boardwalk (one hour), Cape Tribulation Beach to Mason’s Shop (one hour one way), Kulki (Cape Tribulation Beach – 10 mins), Emmagen Creek and Beach (five hours trip from Cape Tribulation, Mt Sorrow Ridge Walk (six hours round walk). Cow Bay Beach Walk (7.5 km), Cow Bay Mountain Walk (5.5 km one way), Cow Bay Creek Walk (6-8.5 km). Daintree Village Tranquility Falls (20 minutes return). Night Walk in the Daintree Rainforest: An amazing 80% of the Daintree Rainforest wildlife emerges at dusk and night. After the sun sets the Daintree Rainforest returns to its night time activities. The Daintree Rainforest comes alive as you can hear the scurrying of ground animals, the croak of expectant frogs and the clickety chirrups of calling insects. Go on a guided night walk around this unique amazing night eco adventure will bring out your inner Attenborough as you come face to face with animals by the light of your lamp light. Discover a night that has remained the same for the last 120 million years. Explore this amazing night world every evening at 7.30 pm (for two hours). Book through Jungle Surfing. Snorkel from Cape Tribulation on the outer Great Barrier Reef and enjoy swimming over pristine reefs where you can encounter turtles and the myriad of colourful reef fish. Relax and kick back on a luxury yacht as you sail 10 nautical miles to the stunning outer Barrier Reef sites of Mackay Coral Cay or Undine Reefs. Snorkel on the pristine reefs of the Great Barrier Reef with a qualified marine biologist who will give you an interpretative commentary as you encounter its amazing underwater marine life. For those not wanting to get so ‘immersive’ and stay dry there is also a glass bottom boat so you can see the wonders of the Great Barrier Reef beneath your feet. The most memorable experience one can have in the Daintree Rainforest is swimming in its crystal water creeks and swim holes. Formed from rainforest cloud dew drops that have passed through ancient forest leaves, you can’t get a more refreshing or rejuvenating experience than this. You too can feel like you are in a shampoo commercial! After millions of years the creeks and waterholes have made an ideal way to escape the tropical sun under the shade of the Daintree Rainforest canopy. Ideal for the months December–June when the sea and swimming pools are a wilting 30 degrees. Dive into the glassy cool waters of a creek and experience instant revitalisation. In their specially designed 4WD tour vehicle you will be taken to the pristine Emmagen Creek in Cape Tribulation. Here, you can swim in its crystal clear waters and search for fish and turtles, butterflies and exotic birds. You will be served a cup of traditional tea or a glass of white wine with a tropical fruit platter to enjoy in these idyllic surroundings. Just a short 15 minute drive from the scenic Daintree Village you will find the footpath to the Tranquility Falls in the Daintree Rainforest. 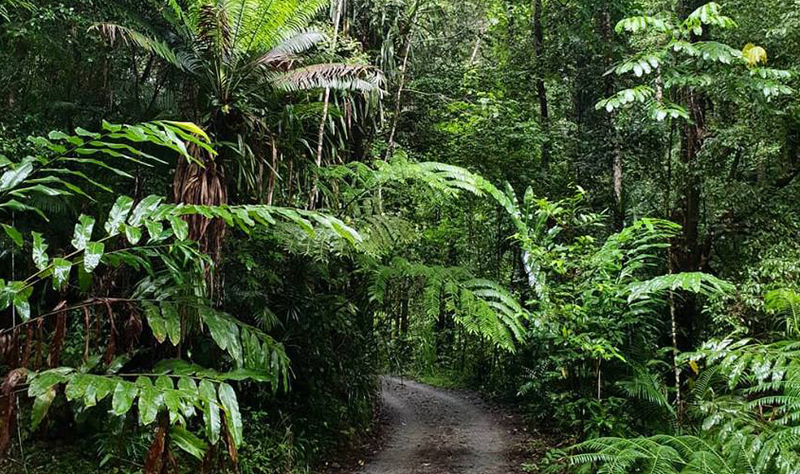 Leave the car behind and walk for around 10 minutes into the lush Daintree Rainforest vegetation. Swim anywhere along the creek and at the waterfall. Tickets are available from the Daintree Information Centre in the village. Take a picnic and some wine and have your perfect day in Paradise. These falls are located on private property in the Daintree Rainforest and accessed by a rugged 4WD overland vehicle. This tour is privy to have a special permit (only a few issued) to have almost exclusive access to the Cassowary Falls. After fording creeks and muddy tracks and walking 100 metres you reach this stunning natural oasis. Like a scene from a shampoo commercial you can stand on a rocky edge as a tranquil crystal pool opens up below you, surrounded by the lush vegetation of the Daintree Rainforest. Be prepared to lose all conversation to the thundering sound of the cascading water from the falls. Your swimming companions will be turtles and shoals of fish as they swim around you. Running through private land at the back of Heritage Lodge and Spa is Cooper’s Creek in Cape Tribulation. Have a delicious lunch in their restaurant and swim in the clear cascading waters of Cooper’s Creek under the canopy of the Daintree Rainforest. www.heritagelodge.net.au 07 4098 9321. Just down from the Mossman Gorge is a beautiful Mossman River tributary that runs by Silky Oaks (private access) under the canopy of the Daintree Rainforest. Have lunch at Silky Oaks and enjoy the deep water (great in dry season) creek of Mossman River that runs behind Silky Oaks (access only through Silky Oaks). Turning left after crossing Mossman bridge on the North side and walking to the Mossman River will take you to where the locals hang out in the hot weather. Located next to the cane train rail bridge and under the auspices of the Daintree Rainforest – this is a scenic, refreshing, cool watering hole that will have you swimming from the rope swing and splashing in the crystal waters. This is an award-winning world class interpretive centre that introduces visitors to every level of the Daintree Rainforest; from the heights of the upper canopy (on their 23m Canopy Tower) to the lower reaches of the Daintree Rainforest floor. The Daintree Discovery Centre in Cape Tribulation was established in 1989 and is now widely recognised as the foremost leader in ecotourism and environmental conservation. If you are self-driving to Cape Tribulation and without a guided tour then a stop here will help you more fully understand and appreciate the amazing eco environment of the Daintree Rainforest. It is an excellent introduction to the wonders of the Daintree Rainforest presented in a fun and informative way. There is also a good chance that you might be able to see a wild Cassowary in their natural habitat. The Daintree Discovery centre is located in the middle of a “Cassowary Corridor” which is a natural corridor used by the Cassowaries. They love to eat on the mature fruiting trees and wander along the beautiful McLean’s Creek, which runs through the Discovery Centre. In McLean’s Creek, which is a natural water source, these majestic birds not only drink but love to bathe themselves in the pure rainwater that runs from the Daintree Rainforest Canopy from the heights of Cape Tribulation. From the elevated walkways you can safely view these amazingly rare birds. Audio commentary is included in your tour as part of the entry fee and is available in 8 different languages. Yes, you’ve heard of wave surfing, wind surfing and kite surfing… but jungle surfing? This is the type of surfing that doesn’t involve even using a surfboard, but does still involve great highs of adrenalin and moving at speed! This surfing involves flying between six Daintree Rainforest canopy platforms at a height of 20 metres. It’s the nearest feeling of being bird as you fly through this stunning Daintree Rainforest environment in Cape Tribulation. You can just smell the fresh, leafy top notes of the Daintree Rainforest with a background soundtrack of chirruping insects, grunts of tree frogs and the ‘wompoos’ of the wompoo fruit dove. From your elevated bird position you can see over the tops of the trees out to the Coral Sea and the Great Barrier Reef and below you, freshwaters streams run like ribbons through the forest floor. Your guides are the multi-talented Kelly Slaters of jungle surfing. With a PhD in encouragement, fun and safety and more facts than Wikipedia you’ll have a whizz of a time. If you are aged 3 to 103 then this activity is for you! No experience is necessary, just a love of experiencing a high-adrenalin charged adventure through one of the most beautiful rainforests in the world.